So as you’ve probably guessed from reading this blog, I love running and eating. If I’m not running or eating you can guarantee that I’m thinking about it. Living in York I am lucky enough to be spoilt with an abundance of nice restaurants to choose from which makes choosing a new weekend haunt possibly one of the best problems to have. On Friday night my friend and I were torn between either Thai or tapas for dinner. 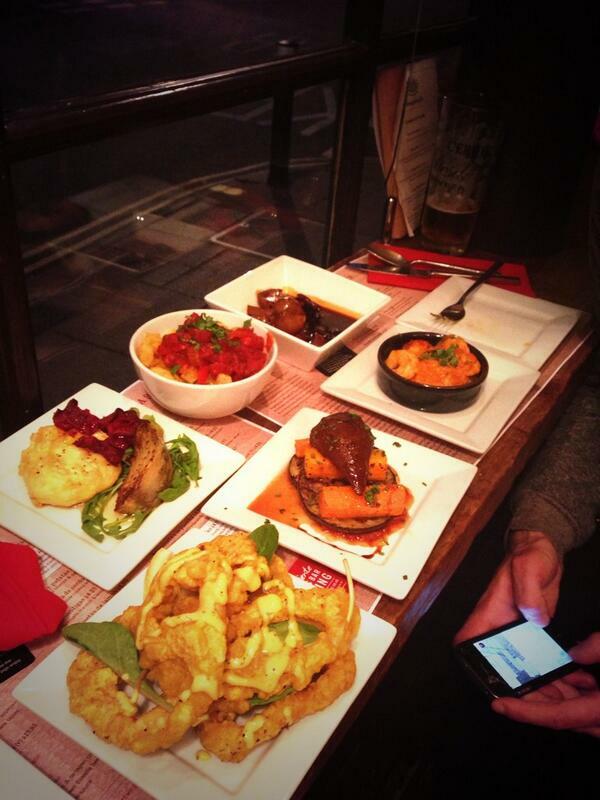 After several pre drinner drinks tapas came out triumphant and we headed to Ambiente Tapas on Goodramgate. We hadn’t booked and the waitress told us that there might be a table for us in the bar area if we came back in about half an hour. Even though our bellies were rumbling the food smelled so delicious and the decor was warm and inviting that we decided to head for another drink before going back later. Luckily when we returned there was a table free for us in the window and we were seated at a long wooden bench. It didn’t offer a roomy space like a table in the restaurant but it was big enough and added to the whole dining experience. After drooling over the menu we decided on bread and oils to start and almond stuffed dates wrapped in Parma ham. I’m a huge fan of dates but I’ve never had them wrapped in ham so decided to try them on the recommendation of my friend. He wasn’t wrong, they were incredible and the almond in the middle made for a nice surprise. Queso de cabra y hinojo – Soft, mild goats cheese lightly battered and drizzled with honey, served with braised fennel and beetroot crisps. All of the dishes were packed full of flavour and even the classic patatas bravas contained more flavour and taste than expected. My favourite was the goat cheese which melted in the mouth and the honey added a surprisingly pleasant sweet taste to it. It was unlike anything I’d ever tasted before. The calamares was also the best I had ever tasted and the restaurants own beer batter really gave it the edge. My friend fell in love with the chorizo dish, so simple yet exceptionally cooked. All in all our bill came to just under £50, with wine and beer as well which I think was reasonable considering the amount we had eaten. We couldn’t resist eyeing up the dessert menu which offered some tasty treats but it would’ve been a case of eyes bigger than the belly if we had said yes. The atmosphere in the bar was great too and had a real buzz about it. When I ventured to the toilets, which are through the restaurant, I was surprised to find that I was actually pleased to have been seated at the bar. The atmosphere in the restaurant seemed a little quieter than the bar area and somehow you didn’t quite get the buzz on offer in the bar. All in all a great evening and I will definitely be heading back to Ambiente next time I fancy tapas.